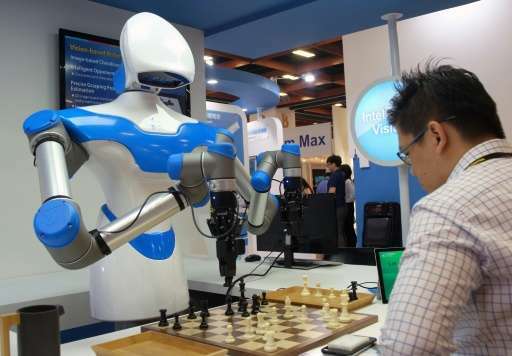 A chess-playing robot stole the show as Asia's largest tech fair kicked off in Taiwan Tuesday with artificial intelligence centre stage. The annual Computex trade show in Taipei comes as Taiwan's President Tsai Ing-wen seeks to boost the island's economy with her "Asian Silicon Valley" project, nurturing startups and attracting investments from major international companies. "It can recognise the shape of a small chess pawn, notify its brain, execute AI movements and interact with its opponent," said division director Lewis Liu of the Industrial Technology Research Institute of Taiwan, which built the robot. Taiwan has already introduced a troop of mini-robots going by the name of "Pepper" into workplaces. The US automaker entered the Taiwan market last September. "We are on our way to become fully driverless," said Hans Li, marketing and communications manager for Tesla in Taiwan. Checking out the car models was Taiwan's Vice President Chen Chien-jen, who said the government had set up an AI lab with the private sector last month and described the field as a "key focus for our nation's development". After a hyped year over virtual reality in 2016, it was still pervasive with companies developing new ways to use the technology aside from entertainment and gaming. Hong Kong firm Zotac displayed its VR backpack that lets the user move around without fear of tripping over connecting wires while playing a video game. But Jacky Huang, Zotac's product director, said many clients used it for non-entertainment purposes, including combat training and post-trauma treatment for soldiers. Taiwan's personal computer maker Acer showed off its VR headset StarVR—developed jointly with Swedish firm Starbreeze—which is being rolled out in IMAX theatres. Acer CEO Jason Chen said the firm hoped to jump from VR to AI in future. Hmm...the chess robots are old idea, I like this Russian chess robot playing with Kramnik over six years ago ( https://www.youtu...UEdh2g-0 ) and yes I understand that this robot is more versatile as it has cameras and it recognises chess pieces. Fukushima disaster and supposed to address its problems the finals of DARPA Robotics Challenge 2015 ( https://www.youtu...c-8cG2zk sooooooo formidably slooooow and then one of the winning robots based on Atlas fell down while waving to public ) all prove that despite huge investments and speedup in neuromorphic computing the versatile humanoid robots are still many years away.